David graduated from the British School Of Osteopathy in London In 1989 and initially worked for three years with well known Melbourne osteopath, Dr Alistair McAlister. 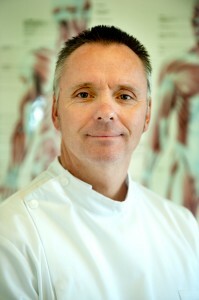 McAlister at that time was the only osteopath to have worked with both the Australian Olympic team and an AFL football club (Western Bulldogs). This work provided a sound knowledge base for when David moved to Bunbury in 1992 to set up his own practice. He has been here ever since servicing the needs of the Bunbury area and beyond. David’s osteopathic clinic in Bunbury is very much a general practice, treating every condition from foot problems to headache and back pain to carpal tunnel syndrome. His gentle approach also lends itself very well to treating pregnant women and particularly the elderly (David is one of only a few practitioners in W.A. registered to treat Department of Veteran Affairs patients). His work with McAlister also taught him how to help athletes and sports people with a wide range of sporting injuries. David has been an active sportsman himself most of his life, and has played a variety of sports from golf to soccer to tennis and squash to running competitively and has competed at state and national level in windsurfing. This gives David a good understanding of what drives sporty and competitive people and also what types of problems different sports tend to create at various levels. David is a firm believer in a PRO-ACTIVE approach to osteopathic medicine, teaching patients things that they can do for themselves on a daily basis. This helps to speed up the rate of recovery considerably and also provides much better long term results. David also regularly attends healthcare seminars and workshops by national and international speakers to keep current with the latest osteopathic ideas and techniques and to continually refresh his basic osteopathic and medical knowledge base.